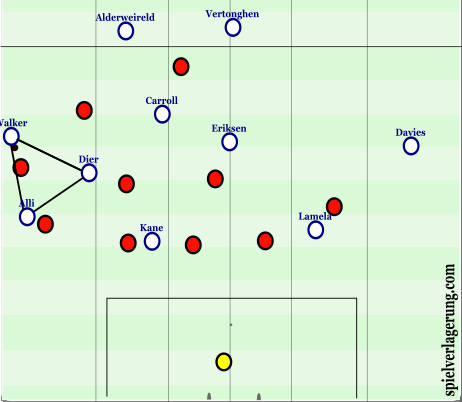 I’ll be taking a look initially at the Positional Play in the attacking phase that Pochettino has successfully put in place this season, and then at Spurs’ pressing strategy when the opposition are building play in their own half. First, however, below is Tottenham’s general starting line-up this season (with potential replacements right of the forward slash). Pochettino has also used a 4-4-2 with both Son and Kane playing as centre forwards at times. Tottenham play an attacking, possession based game similar to that of Pep Guardiola or Thomas Tuchel, with added influences from Marcelo Bielsa, whom he played under for both Newell’s Old Boys and Argentina. As you’d expect from a team using these principles, they build up from deep with short passes from the centre-backs and pivots. It is the pivot’s job to create triangles and rhombuses, making it easy for Spurs to pass the ball around the opposition’s pressing lines and up the pitch. Below is an example of this. A good structure in possession will allow the ball carrier to have immediate open options as soon as he receives the ball, meaning he can move the ball on more quickly, and make for a more effective and entertaining possession game. In the above example Dembele creates this cohesive structure with his link up play and movement. Firstly, we can see how Dier, the pivot, has moved into the right back position while Walker moves higher up field. This is a routine part of Spurs’ positional play. It allows the attack-orientated Walker to play higher up the field and stretch the opposition both horizontally and vertically while Dier covers behind him, using his good passing and awareness skills in build-up as well as his defensive instincts in defensive transition. Dembele starts just in front of the centre-backs, moves to create a triangles with Dier and Alderweireld as well as Dier and Walker, receives the ball and finally creates the passing triangle with Walker and Son. Walker can play a long pass behind Palace’s defence to Son. In the first image, the centre-backs are wide apart and Walker is high up the pitch. Walker moves higher up the field and Dier moves out to fill his space, while Carroll also moves higher up the pitch. 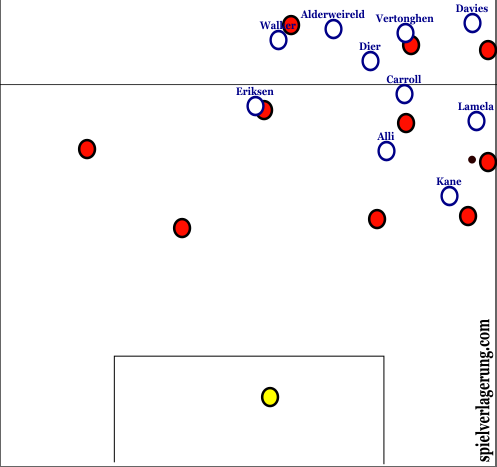 This pulls away Kone and Lukaku for Everton, giving space for Aldeweireld and Vertonghen as shown in the third image. Everton’s intention for their centre-forwards to tightly mark Spurs’ pivots is clear however Spurs have used this to create space for their centre-backs to find a pass into the final third. When in possession in the opposition’s half, Spurs use spatial concepts similar to that of many sides that adopt a form of Juego De Posicion. Alli causing problems in between the lines. 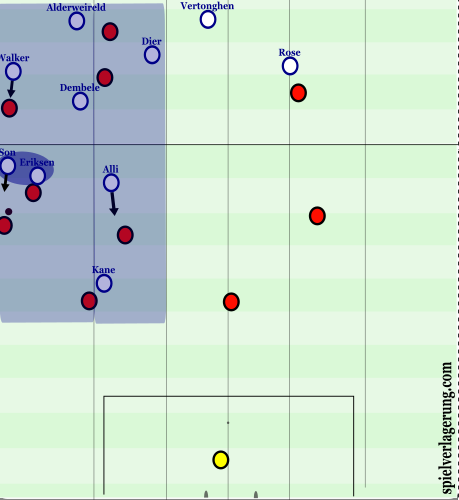 Above we can see that Tottenham have four main horizontal lines across the field in which they are playing, three of them highlighted (the other is the centre-backs when they are in possession). 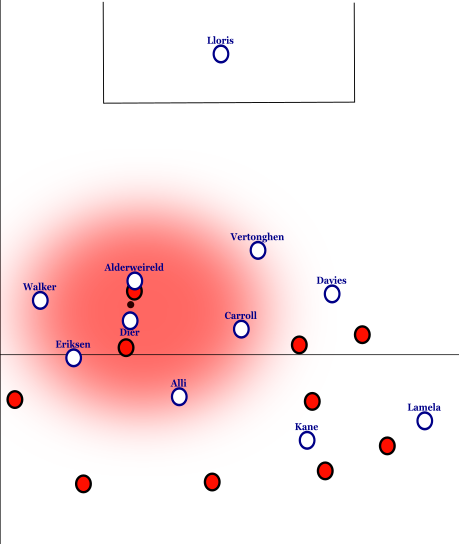 This is against the three horizontal defensive lines of Crystal Palace. As a pass is made from the centre-backs to Dembele, Palace have two midfield lines that are ordered to stay as a line versus three sets of horizontal staggering from Spurs. With Kane and Son holding back the Palace defence that are unwilling to move forward to play him offside, and Dembele holding possession just a few yards ahead of the halfway line, this has opened up space in between the lines for Alli. A lot of Spurs’ middle-third to final-third conversion play is them moving the ball along this second of for horizontal lines, aiming to move it into Alli in between the lines. Above, the ball gets played into Alli and Palace are on the back foot and their centre-backs are stretched. 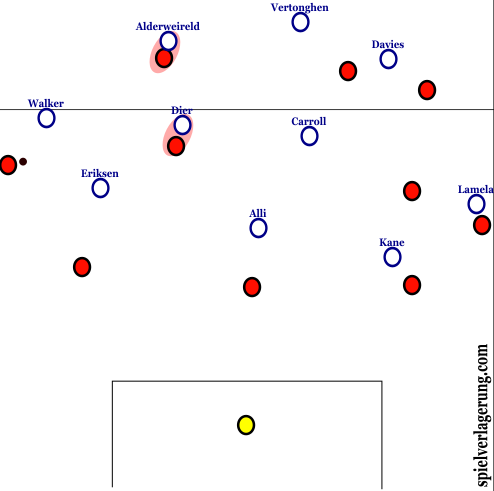 Eriksen, although billed as a left-sided attacker on the teamsheet, rarely finds himself on the flanks and normally roams in central and deep areas. He makes sure Tottenham have numerical superiority in deeper build-up, giving them passing options aplenty. 1.Dier with ball on flank. 2. Tottenham rotation of positions. Above, Dier has the ball in the flank where Tottenham have a potential 3v2 overload. To help utilise this overload and ultimately create space in Everton’s back four, the three Spurs players simultaneously rotate positions. It starts with Walker dropping to receive the ball from Dier, to help maintain Spurs’ width high up the pitch, and to prevent Palace from having an extra player, Alli runs into the space Walker has vacated. After passing the ball into Walker, Dier moves into the space Alli is leaving to create this 3v2 overload on the flank. All this happens too quickly for Everton to deal with and is something that Pochettino would have worked on as part of his positional play schedule in training. 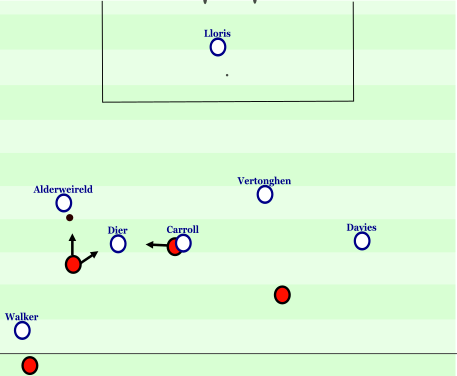 The ball subsequently gets played into Dier who is unmarked and can move it into the middle of the field, where Spurs now have a 3v2 overload of Dier, Carroll and Eriksen on two Everton centre-midfielders. In this first image, Eriksen pulls a player away from Dier, giving him time. Alderweireld and Dembele have pushed up in halfback positions to provide access to the halfspaces. 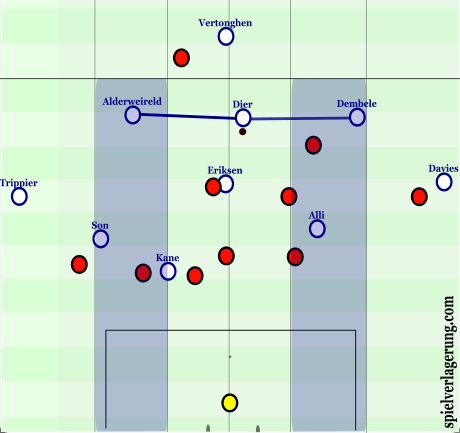 Spurs have each fullback wide, high enough to draw the interest of the opposition defence, but also deep enough to be a viable passing options in two rhombuses that have formed (Adeweireld, Eriksen, Trippier, Son and Dembele, Eriksen, Alli and Davies). The ball is switched to Alderweireld. Tottenham have a 3v2 overload in the wing and halfspace (ignore Kane) which can be utilised if Alderweireld carried the ball forward. Most teams would probably play wide to Trippier at this point. Alderweireld does neither. Instead, Alderweireld takes a touch and shifts it back to Dier. Palace are now less centrally compact. A passing lane has formed in between Alli and Eriksen, Kane peels off the centre-backs to receive the ball and then combines quickly with Eriksen who plays Alli in on goal. Alli, who played in a deeper midfield role for MK Dons, thrives playing off the shoulder of Harry Kane for Tottenham. Spurs are an efficient attacking force and some of their players naturally need fine tuning as to how to play in an attacking structure like this. Dembele and Dier aren’t highly intelligent as to when to get the ball into overloaded areas quickly and at times play the ball too slowly. After a left-back, I would say Pochettino should prioritise adding an elite pivot to his squad should he still be Tottenham manager going into next season. Tottenham also play too many long diagonal balls. They do this to create 1v1s in wide areas and progress up the pitch however they are often misplaced or generally not effective. As I have mentioned before, just because the space is out wide, it doesn’t mean that this is the area the ball should be put into. 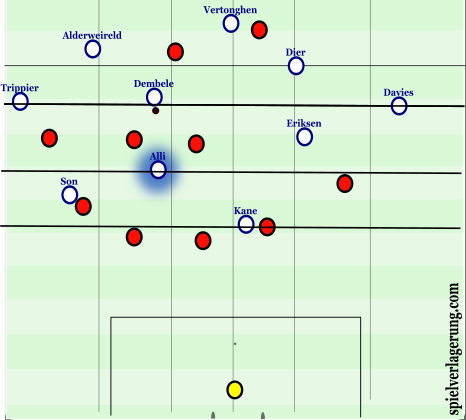 Spurs’ pressing is perhaps less tactically complex and intense than that of a team such as Roger Schmidt’s Bayer Leverkusen however it is far ahead of any pressing scheme the Premier League has possibly ever seen. It’s more of a semi man-orientated system where the man with the ball at feet and his immediate options will be pressed as and when applicable while the overall defensive shape is held. Spurs’ pressing is very local to where the ball is and is aimed at preventing the opposition from progressing up the field vertically as well as at times forcing them to play to isolated players on the touchlines. Here, the Palace player receives the ball on the left flank. The whole Tottenham team moves up onto the nearest man to restrict the player’s options and force him to play the rushed pass. Notice how Tottenham have overloaded the flank with five players, making sure there is no way Palace can play the ball vertically through this area successfully. Son presses the ball while also preventing the pass up the touchline. The other key point is that the team all push up towards the ball and restrict the ball player’s space. 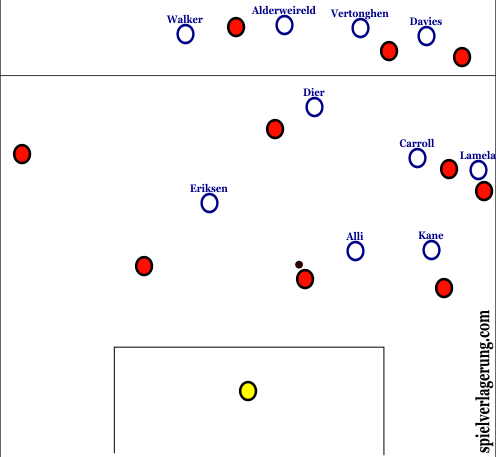 Most Premier league teams would drop off into their organised 4-4-1-1 defensive shape and have one or two players feebly pressing the area the ball is in when the opposition has the ball this high up the pitch. 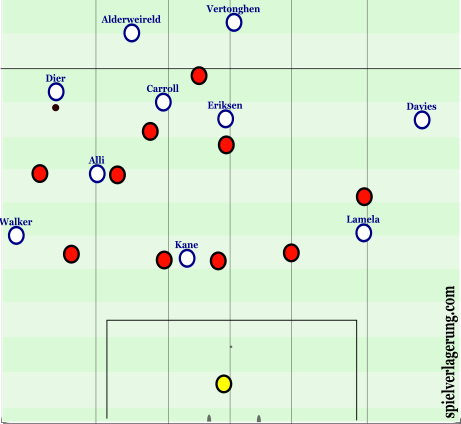 In ‘1.’ we can see Tottenham’s high line and compact coverage, again there is no way Everton can proceed up the line. They are forced to switch play over to Baines at left-back who is isolated. Tottenham shuffle across more effectively than Everton do and stick tight to his options, forcing him play to Kone who is challenged and Tottenham win the ball. This is an example of how Tottenham’s pressing is aimed at diverting the ball out of an area which is potentially dangerous into one where Tottenham have control. The GIF below sums up their basic but effective pressing style. Ball-local, preventing turns and preventing them switching play. Palace forced into isolated player. Similar to the previous images, Spurs force Palace to play square balls along the back and then into a player who is isolated and marked tightly by Danny Rose. He cannot turn. As the opposition travels with the ball over the halfway line, Tottenham then tend to settle into an extremely vertically compact 4-4-1-1 shape with Alli and Kane pressing while the other players block passing lanes to potential players in between the lines. They have quite good lateral coverage of the pitch as shown below. They play with a high-ish defensive line which allows them to have this vertical compactness. Their centre-backs are man-orientated on the opposition’s centre-forwards and this vertical compactness allows a central midfielder to step into the defensive line should the centre-backs be pulled too far apart. Tottenham’s pressing, because of its lack of structure, is sometimes weak and easy to pass around. It also sometimes lacks co-ordination and would obviously benefit from a bit more work in training, especially for newer players such as Heung-Min Son. Leicester have the ball in an area which Tottenham have controlled due to good man-orientated coverage. As the ball is played forward to a dropping man however, Son tries to press the man, engaging in the ball-orientated pressing he was trained in at Leverkusen with Schmidt. This player wouldn’t need to be pressed by Son as Trippier has him covered. The player simply plays back to the man he has received from who plays it to the player Son has vacated to wrongly press the first receiver. This, if anything, is an example of how, contrary to some popular belief, pressing schemes must be strategically worked on and it isn’t enough for a manager to just tell his team to “press”. Pochettino no doubt does work hard on his pressing strategy in training although in this example Son has reverted to old habits and engaged in the wrong pressing strategy. I hope I’ve given a brief outline on how Tottenham structure their attack and defence. Mauricio Pochettino has really proved himself to be a fantastic ‘coach’ who takes the players he has and works with them in training to produce fantastic things on the pitch. The fact that they have also scored more goals than any other team in the league from set pieces is testament to this. 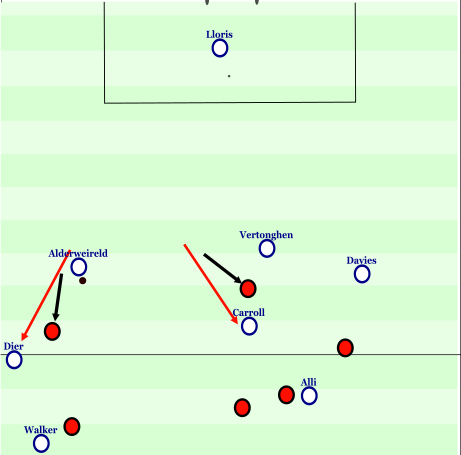 In attack, they use basic Juego De Posicion principles to harbour a successful yet entertaining possession game, and in defence they use local compactness and pressing to stop the opposition progressing up the field in certain areas and guiding them to areas which Spurs themselves can control. I will be fascinated to see if their positional play can be as effective against some of the top defences in Europe and if their basic pressing strategy will be found out against sides that can move the ball very efficiently. It looks as if Tottenham’s Champions League spot is nailed on so this is an exciting prospect for next season for fans of attractive possession football. I also believe they have all the credentials to mount a serious title challenge for this season, a goal which I think they’ll be successful in achieving. I hope you enjoyed this post. If anyone would like the screenshots from the scenarios I’ve shown above, or if you have any other comments or queries, please use the section below. Hi, great analysis! Really want to learn more about this Tottenham team as they’ve been so fun to watch this year. I’ve looked at your Juego de Posicion articles and found them really informative and helped frame the ideas you spoke about here. What I’m curios about is Bielsa and his influence on Poch. I’ve looked all over and can’t really find an in-depth discussion of Bielsa and his methods. Could you point me towards one? Or perhaps even briefly explain it through an article here? You implicated that new signings should be made to replace Dier and/or Dembélé. As a spurs fan watching nearly every single game of Tottenham, I disagree in this point – Dier might be the most important player in Pochs system, as he combines centre back qualities with good passing and flexible positional play, suiting him perfect for the half back position he plays. If you watch games without Dier (e.g. vs Fiorentina away) you see the big difference in terms of possession and dominance in midfield. I agree that he hasn’t the passing speed and vision of other defensive mids, but I’m not sure whether there is any affordable player with similar abilities but more awareness of passing options. And Dembélé, despite his lack of creativity, might be the most influential player this season. When he played, he was just great winning and carrying the ball forward with his physical presence, drawing other players and generate space. Yes, he somehow lacks the ability to see the deadly passing option but that is not why he is in the side. Combining him with creative players like Eriksen and Lamela and players able to use space (Alli, Kane, Son, Chadli) was the key in some fixtures imo. Nonetheless I think we need cover for Dier and maybe Dembélé (due to his injury proneness) aswell. As for a Dier cover I haven’t any idea tbh. A player I’d really like to see at Spurs is André Gomes, who in my eyes is the perfect hybrid player out of Dembélé and Alli. Physically and technically strong, gets in the box with power and has a good shot, not to mention his great passing. Last but not least, why do you think left back is a position we lack quality? Rose and Davies were one of the best players on the pitch in many games, and especially concerning the lack of good left backs I think we at Spurs don’t need to worry about this position. Hi, I hope that having read my analysis you understand I feel Dembele and Dier have been fantastic this season. Having only these two as central midfield options, with Alli not yet being stable enough in my opinion to play as part of a double pivot, isn’t ideal. Adding an elite quality pivot to the squad would add cover in this position, create healthy competition for places, give Pochettino tactical and squad rotation options, and finally maybe add some of the penetrative nous that Spurs currently lack at times. Gomes would be a great player for Spurs to get. In terms of left-back, although he has shown encouraging signs of improvement this season, I still feel Rose isn’t intelligent enough and too defensively liable to play in a title-challenging side, which is what Spurs are. Thank you for your fast reply. I think I just misunderstood the phrase “elite” as a player to replace Dier rather than convering him. Great article. Is there any way I can get the screen shots of the scenarios you mentioned above? Contact me on twitter (@flyingwingback) or send me your e-mail address and I’ll see what I can do. Brilliant analysis, been raving about Spurs all season and nobody seems to want to give them any due attention or credit. Since Pochettino came in they’ve been probably my favourite side to watch in the league, much like his Southampton side. Thanks. I agree they’re easily the best side to watch in the league. Cannot wait for the Pochettino – Guardiola showdown next season, should prove to be a great set of games.